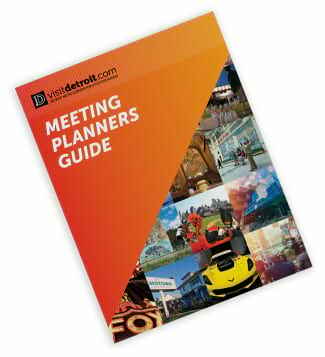 Let us help you tell the story about meeting in The D. We created several ways to deliver upbeat and relevant messages to share with your group. Detroit is America’s great comeback story, a city ready for anything. We’re a complete-package destination with new restaurants, retail and walkable downtown riverfront; high-energy championship sports, nightlife and gaming; and nationally recognized music festivals, cultural attractions, architectural wonders and more. Come and feel Detroit’s irresistible energy. It’s easy for us to brag about Detroit. We have so much more to offer than anyone ever imagined. You can get your group or family revved up by using the copy we created below to promote Detroit as your destination city. Where else can you take an automobile factory tour, visit where the first Model T was built, or be in awe of the great auto baron’s lush estates? Start up your engines and immerse yourself at the America’s greatest history attraction, The Henry Ford, with an amazing collection of transportation exhibits plus President John F. Kennedy’s limousine, a 50-ton Gothic steam engine, the Rosa Parks bus, and much more within the Ford museum. On the Village campus take a ride in a classic car down Main Street, or stroll the lanes and visit seven historic districts that feature the Thomas Edison Menlo Park Laboratory, the Wright Brothers bicycle shop, the home of Steven Foster, a working farm, and other historic American treasures. At the Walter P. Chrysler Museum, view antique, custom and concept vehicles interspersed with interactive displays and historical exhibits. Detroit is Motor City and a great destination you auto visit. Can you hear the voices? Michael Jackson, Diana Ross & The Supremes, Smokey Robinson, Stevie Wonder, The Temptations, Martha Reeves and the Vandellas plus many other great talents created the unique Motown sound in Detroit. Plan a stop at the Motown Historic Museum – Hitsville USA, and feel the vibrations of the sound that rocked the music industry. Entertainment abounds downtown at three major casinos and a first class theatre district with more than 13,000 seats. Don’t miss the fabulous productions at the majestic Fox Theatre. Enjoy opera, the symphony, jazz and major headliner shows from coast to coast. Take a ride on our above ground People Mover and stop at Greektown for great ethnic flavors and music. Summer months bring major music festivals from the Downtown Hoedown and Detroit Jazz Festival to the techno beat of Movement: Electronic Music Festival. The city offers a wide range of eateries including Detroit’s iconic hot dog hot spots, Lafayette Coney Island and American Coney Island, right next door to each other. Upscale dining with delectable cuisine and unforgettable ambience are found throughout downtown. Don’t miss a beat — visit Detroit. Hear the cheers and pass the peanuts. Sport fans love The D, and the Tigers, Lions, Pistons and Wings. For many folks tailgate parties are more in than cocktail parties. Every season offers a ballpark or arena full of professional athletes hitting, passing, dribbling or sending a puck across the ice. Two state-of-the-art stadiums sit across from each other — Comerica Park for Detroit Tigers action, and the enclosed Ford Field for Detroit Lions games. Both stadiums are downtown and joined by nearby Joe Louis Arena, home of the Detroit Red Wings. The Palace of Auburn Hills plays host to the Detroit Pistons basketball team. All sporting venues also are the site of mega headliner shows including Detroit’s own Kid Rock. The D truly rocks. Detroit is game for your visit. Climb aboard a riverboat and cruise the Detroit River to enjoy the international skylines of Motor City and Windsor, Ontario, Canada. Ride a carousel, frolic in water jets or rent bikes for the whole crew on our RiverWalk and tour the city on two wheels, or hop on a Segway for a self-propelled exploration of downtown area sights. Campus Martius Park is a great place to relax and offers ice skating fun during winter months. It’s a short distance to the Cultural Center in the city’s Midtown district with a landscape of art and history museums, dining, entertainment and much more. The collection at the Detroit Institute of Arts is among the top six in the United States. Seek out special exhibitions, kid-friendly workshops, artist demonstrations, film and music programs. Visit the Charles H. Wright Museum of African American History, the largest museum of its kind in the world. Or take the entire clan on the elevated People Mover for a 2.9 mile loop around Detroit with great views of downtown and the riverfront. You’ll be more than amused at what Detroit has to offer. Put on your shopping shoes and head to downtown Birmingham for a day of shopping at one-of-a-kind stores for apparel, home furnishings, gifts, toys and more. Birmingham has an outstanding collection of restaurants and cafes plus movie theatres. Head out to the Somerset Collection in Troy for upscale shopping anchored by Nordstrom, Bonwit Teller, Saks and Macy’s. Great Lakes Crossing is the ticket for outlet shopping with nearly 200 stores and eateries in Auburn Hills. Visit funky and edgy Royal Oak and Ferndale for great tastes, artful retail, boutiques, music and movies. The Macomb District offers up two major shopping areas: The Mall at Partridge Creek designed with an outdoor vibe and the enclosed multi-level Lakeside Mall. Dearborn is the home of The Henry Ford, America’s greatest history attraction; a spectacular array of Middle Eastern restaurants and bakeries plus Fairlane Mall for shopping. The Greater Novi area offers Laurel Place for shopping, hip and chic bars and restaurants, golf courses and lush parks. Several communities have charming historic downtown areas for browsing, shopping and dining. Metro Detroit has it all.